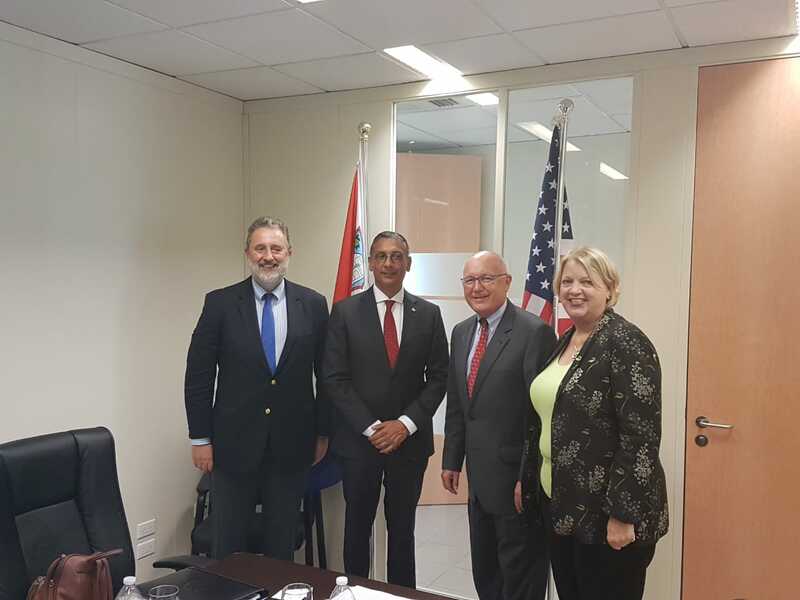 The United States Ambassador to the Kingdom of the Netherlands Peter Hoekstra, met with Acting Prime Minister and Minister of Finance for St. Maarten Perry Geerlings on Wednesday this week. The Ambassador and his delegation, which included Netherlands Ambassador to the United States Hendrik “Henne” Schuwer and US Consul General to Curacao and Chief of Mission to the Dutch Caribbean Islands Margaret Hawthorne, arrived in St. Maarten on Wednesday afternoon and were welcomed by Minister Geerlings in his capacity as Acting Prime Minister of St. Maarten. During the meeting, the Acting Prime Minister and the US Ambassador discussed several topics of mutual interest including establishing US Pre-Clearance at the Princess Juliana International Airport (PJIA), and the possibility of establishing a local US-Based Agency. The Acting Prime Minister was supported by a representative of the Department of Foreign Affairs and the Secretary-General for the Ministry of General Affairs. According to a release issued by the Ministry of Finance, the US-Ambassador has embarked on a regional visit to all the Caribbean Dutch territories.